The migrant caravan — a mass of thousands of Central Americans who have walked for months to seek asylum in the US — arrived at the Tijuana border in November 2018. Common misconceptions due to our current political climate associate danger, violence, and a threatening drug cartel with the border town and migrants. But traveling to Mexico, visiting the shelters, and connecting with individual migrants — many of them young, unaccompanied minors — sheds light on a much different experience. Grlswirl, a grassroots, all-female skate community from Venice, California, and an all-female team consisting of a photographer, videographer, journalist, and translator ventured to migrant refugee shelters in Tijuana. 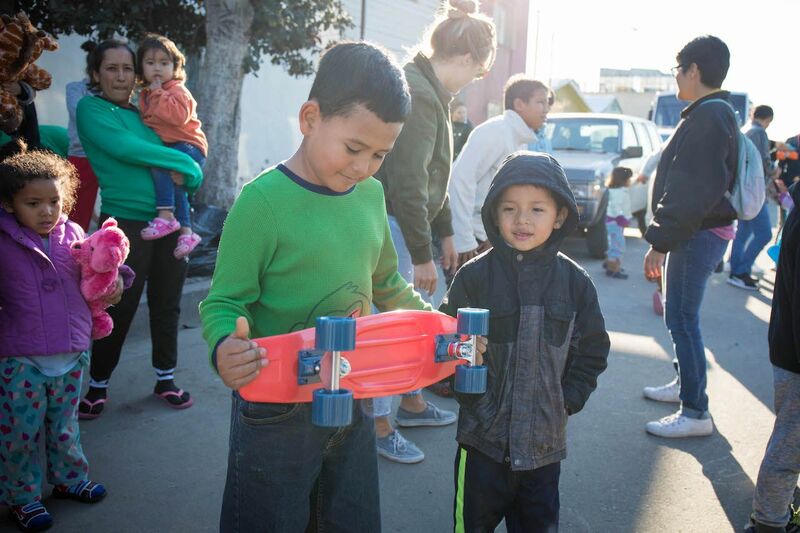 In this Matador Original video, the crew of 10 women journey to three shelters with trunks packed full of 100 new skateboards and much-needed donations with the goal of teaching migrant children the basics of skateboarding. 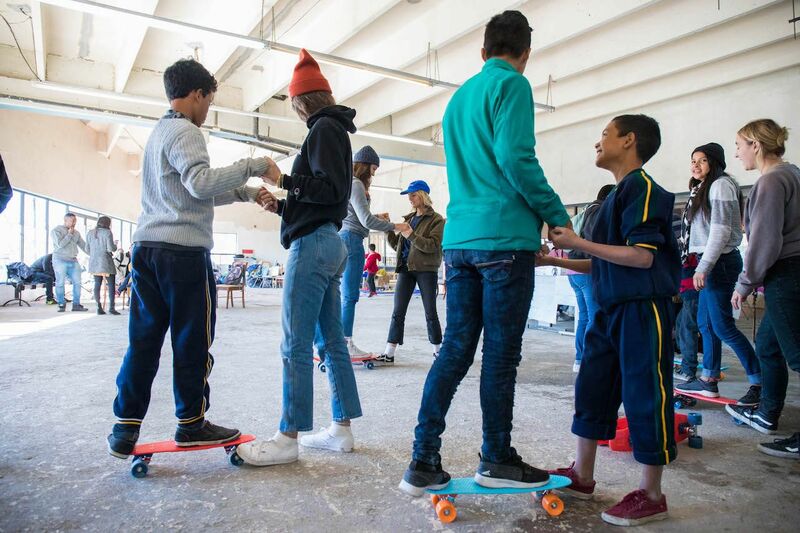 What emerges through the skateboarding lessons is personal connections, laughter, and positivity that offers a momentary reprieve of the refugees’ harsh realities from their current daily livelihoods. Kids get to be kids again through the simple act of skateboarding. The stories of the migrants settled in the caravan camps parallel one another in challenge, difficulty, and purpose. Many walked thousands of miles to Tijuana from Central American countries including Guatemala, El Salvador, and Honduras. Often with no more than the clothes on their backs and a backpack of belongings, they’ve fled violence or persecution and the lack of socioeconomic opportunities. 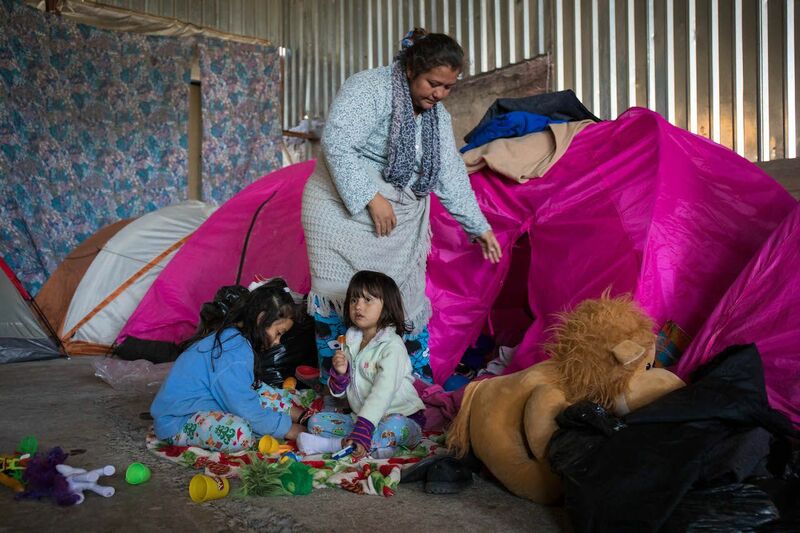 They wait at camps in Mexico for asylum in the US without any assurance of when that will be — especially in the wake of President Trump declaring a “national emergency” over border security and vetoing Congress’s attempt to override the order. When it comes to daily life in the migrant caravan shelters, overcrowding, wet, and filthy conditions are their normal. Food and extra clothing are minimal. Access to personal hygiene amenities is even more limited. Thousands of people are stuck waiting — exhausted, dirty, uncomfortable, and frightened — in shelters consisting of tent cities, to file for asylum in the US or have their cases reviewed. Throughout the documentary, GrlSwirl meets children whose living situation robs them of the lighthearted play and laughter of a typical childhood. The goal of the project is to teach the children an active skill, empower them with the strength and discipline required to skate, and above all, just have fun and be a kid again. At the same, these women are challenging stereotypes they face themselves as female skaters, teaching and bonding with both young boys and girls. 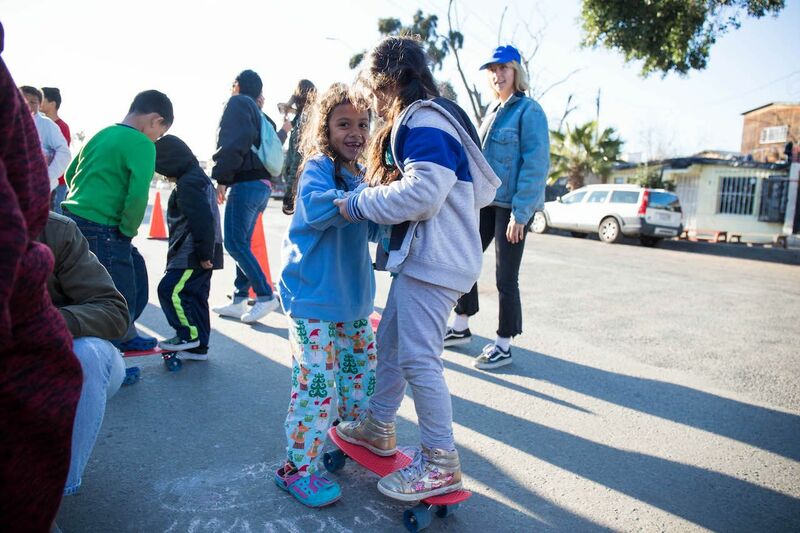 Visiting two more shelters, GrlSwirl continues to break language and cultural barriers, teaching dozens more children the basics of skateboarding. 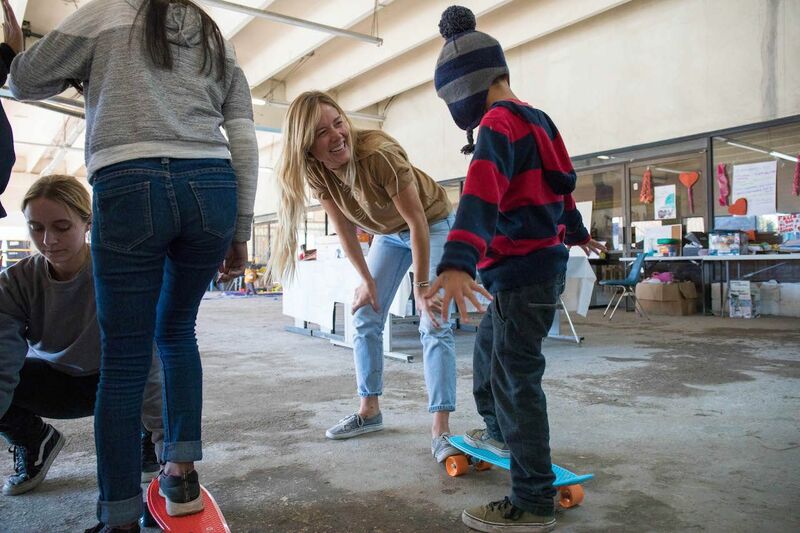 Through this compassionate action, the shelters fill with the sounds of laughter and rolling skateboards. 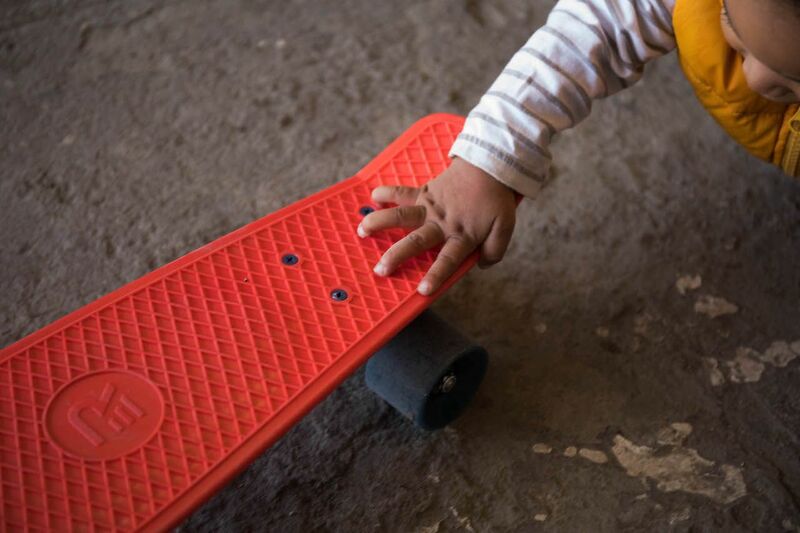 Afterward, shelter workers told the organization that the kids spend their whole day practicing and maintaining their skateboards (and decorating them with stickers), and they sleep with the boards at their bedside. “My main takeaway from GrlSwirl’s visit is the way the women made each kid feel. They felt seen, they felt valued, they felt like they mattered,” Velarde said. Editor’s note: Due to many of the children being unaccompanied minors, some of the photos do not show the subjects’ faces in order to protect their identities.